My friend tossed her shiny blonde hair over her shoulder and said, “they called it ‘fettuccine alfredo’ but it doesn’t taste as good as the fettuccine alfredo I’ve had with my parents.” Of course I had to ask her where to get the good stuff. In an ernest voice that only little kids can have, she answered me: the best fettuccine alfredo in the world is at Sizzler! I’m pretty sure I would have agreed with her then, but nowadays, I’m betting that the best fettuccine alfredo in the world is the one you make at home to share with family, a couple of good friends, or maybe even just your best friend. 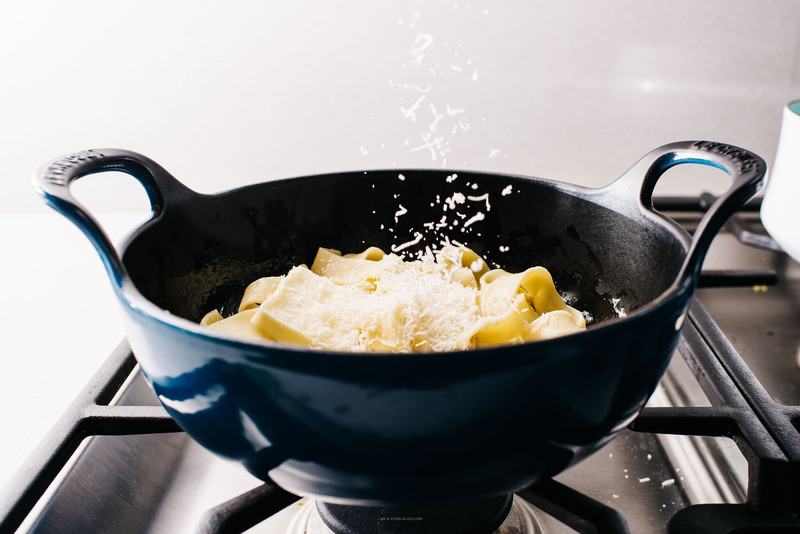 The truth is, even though there are a multitude of recipes out there for alfredo that call for cream or milk, fettuccine alfredo really only needs three ingredients: pasta, butter and Parmesan cheese. 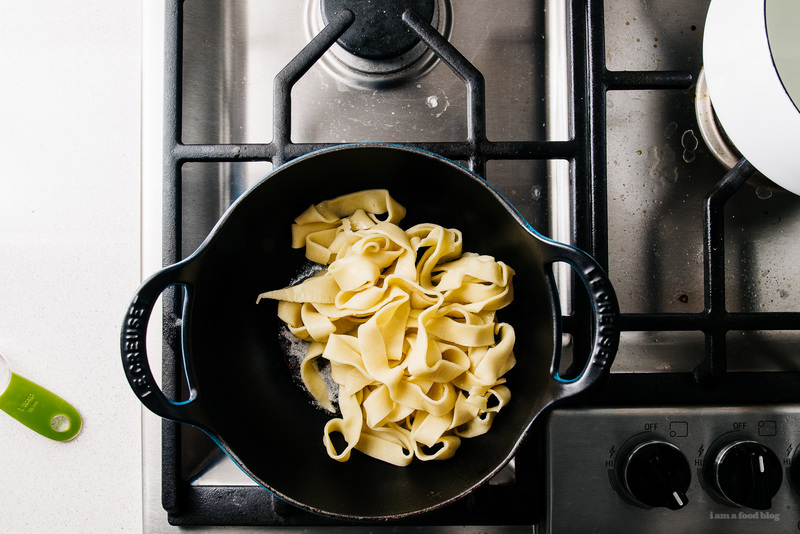 Since classic fettuccine alfredo is so simple, it’s key to have quality ingredients. First off, the pasta. Bonus points if you make your own pasta (as I did here), but if you’re in a pinch store bought fresh pasta or high end dried pastas will do the trick as well. After you source your pasta, you’ll need some butter. I’m partial to Icelandic butter, when I can get my hands on it. And, of course, the most important ingredient of all: Parmigiano-Reggiano. Three ingredients and you’ve got yourself a quick and delicious dinner! Cook the pasta according to the package. 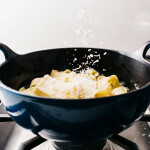 In a heavy bottomed skillet, melt the butter over low heat. 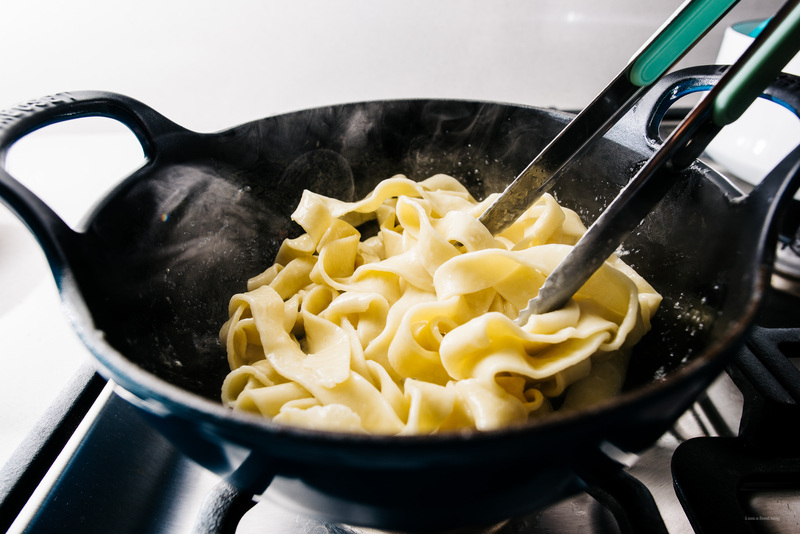 When the fettuccine is cooked, use a pair of tongs to lift the pasta straight from the pot into the skillet filled with the butter. Save the pasta water. 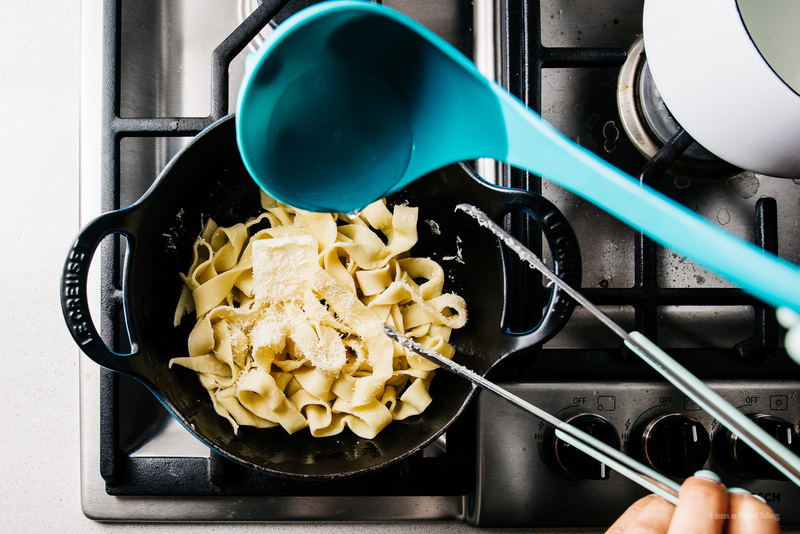 Turn the heat up to medium and use the tongs to swirl around the pasta. Add half the cheese and toss until melted and incorporated into the sauce. Add pasta water, a tablespoon at a time if needed to loosen the sauce. Add the remaining cheese and repeat until each strand of fettuccine is coated. Serve immediately with freshly ground pepper. hahahah i’m imagining the girl telling you about sizzler’s fettuccine alfredo in a snooty voice, a la mean girls. So funny about your school friend! That totally sounds like some of the girls I grew up with. I’m loving this classic meal in all it’s simplicity, YUM! Good thing we just got a pasta machine so we can make this!! Hahahhaha that Sizzler fettucine tho. I want a fry pan just like one in picture,where can I get it? I have been moving house all day and am so hungry. After reading your Alfredo story I now want to eat my phone! Doesn’t help I’m sitting in an Italian restaurant waiting for pizza and am getting killed slowly by the wafting smells of garlic and cheese! Well done Steph! Ah, fettuccini alfredo. When it’s good it’s great and when it’s bad it’s good. I’ve never made it using only the pasta water for sauce, but I think I’ll try that the next time I have a craving. This sounds a lot more like cacio e pepe without the pepper. An alfredo sauce is characterized by some kind of milk or cream constituent. Nevertheless, it looks great. Sorry, I meant without the same volume of pepper. So simple and looks delicious! Will have to try this. Also, is it possible to make fettuccine without a pasta machine? We can call it old world style? yes! for sure, a rolling pin to roll and a knife to cut definitely works! Looks delicious. Going to try this during the week especially since it is so simple. Really enjoyed hearing your first experience with Fettuccine Alfredo was at school. I thought it was hilarious when your friend told you the best she had was with her parents at Sizzler! Unfortunately I don’t remember my first experience with Fettuccine Alfredo, but I love how the thickness of the noodles seem to absorb a lot of flavor! Not to be that guy but this is more like carbonara without the bacon or egg. It’s not quite fettuccini alfredo. Looks tasty though. I work at a school and we use a little more ingredients but I love your version. I’ve eaten my noodles like that for years, because I don’t like spaghetti sauce and my family does. So I would make mine on the side just like that. But here at school it is a big seller and I couldn’t believe it we make it with non fat milk, cream of chicken, cream of mushroom Campbell’s of course and Parmesan cheese with rotini noodles al dente. We always sell out.